Pamphlet is a series with the HeadStuff Visual Arts Section and artist Aaron Smyth. Aaron will give fortnightly insight into his artistic praxis including research, inspiration and the practicals of everyday life as an artist in Dublin in the build up to his exhibition in Moscow this year. For Pamphlet 1 | Introduction click here. As an introduction to my work I decided it was best to start from the background, looking through the influences as a way towards building an understanding and providing an access point to both my investigations and my practice. For this the best place to begin is the studio. From an early age I always understood the Artist’s studio as an unique environment which encapsulated the alchemy of production. 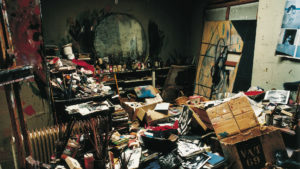 This is most apparent in my memory of visiting Francis Bacon’s studio in the Hugh Lane. Looking through the glass into that Twombly-esque cacophony of colour and clutter I got a sense of the energy and chaos that come together in his work. Looking past this I began to notice a fine speckling of art books, prints and photographs that occupy the hinterland between paint tubes and canvas. It is in these images and books that you can begin to decipher shapes and figures which blend with the artists personal experience, memories and emotions to create the complex matrix of thoughts and references that manifest in Bacon’s work. This idea resurfaced more recently during a studio visit with Patrick Murphy. He remarked that he takes the time to informally examine the artists environment when he visits a studio, scanning the stacks of books, artistic references, critical texts and research pinned about the walls as a way to get a background into the works. Sitting here in my studio, my eyes wander through the things I have collected and pulled together to inform different parts of my own work. Stacks of books and photocopies bring together catalogues from Dutch artist Natasja Kensmil with heavyweights Nancy Spero and Helen Chadwick as well as contemporaries like Cameron Jamie and Aaron Curry. Of all the artist books that gather in my studio the most recurrent name is Kiki Smith. In her work the American artist delicately blends identity politics, mythology and the body addressing both social and philosophical concerns. She does this in a way that doesn’t feel didactic or overbearing leaving space for the audience to experience and interpret. It’s this methodology that stands as an important model for me in my approach to production.? ?In this way I see my own work as an open framework for an audience to explore, projecting their own experience, memories and emotion into the work towards a personal interpretation. This approach can be seen throughout my artworks. In Bloom and Loveless I &II stand as strong examples. 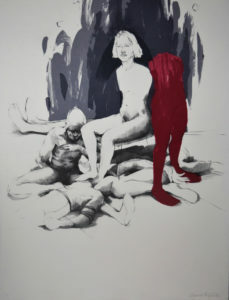 They present layered and abstracted figurative images and scenarios, that at first appear as a authentic representation but then reveal themselves as fabrications. These impossible realities are intended to highlight to the audience the artwork’s focus on internal tensions, one which exists not in the physical but metaphysical or psychological world. In production I try to achieve this in a manner void of concrete interpretations; the synthesis of references, figurative imagery and titling is intended to provide equivocal access points for an audience towards a personal reading of the work. The collection of Art books are interspersed with Whitechapel volumes on Sexuality and Time, Reference books on The body in contemporary art and seminal texts on Identity, Gender and Philosophy. Each of these provide their own unique element in informing the investigation and composition of the work. I often try to underpin these with visual reference points; blending a wide range of source material from the films of Ingmar Bergman and Wong Kar-wai, to Classical Sculptures and Iconography and Self shot reference imagery and figures from fashion magazines. By blending cinema, visual culture and art history, I try to appropriate and manipulate both the image and it’s representational conventions to instil a comment or reflection on the modern world and our contemporary concerns while remaining global or indeed timeless. ‘Häxan’ blends visual reference to Carl Theodor Dryer’s Le Passion de Jeanne d’Arc, digital avatars and the disembodied head as a way to investigate the ‘projected’ and ‘performative’ construct of Witchcraft. The other main source lies in volumes of fiction and poetry which offer a counter point to denser texts. At times these have been works from Sharon Olds, Maggie Nelson, Yasunari Kawabata and Han Kang. My most recent obsession is Danilo Kiš a Yugoslavian writer who sits in a similar ilk to Jorges Luis Borges, blending realism with fantasy or dreams. In The Encyclopaedia of the Dead, Kiš tiptoes this borderland between the real and the imaginary, relying heavily on intertextual reference which further complicated the narratives. One of the short stories entitled ‘The Legend of the Sleepers’ evokes a grey area between reality, spirituality and dreams that pushes our conception of reality by repeatedly stoking our uncertainty. This short story became a big influence on recent work which strive to blend representational imagery and observational drawing. Drawing from paper sculptures I strive to capture both 2-dimensional image and 3-dimensional texture and tone, visually questioning the real and the representational nature of the image. In this way I strive to blend reality and fiction to reflect on the nature of identity and reality itself. Each of these elements is filtered and collated with my personal experience and memories, manipulated and collaged towards into my work. These combinations seek to reframe reality, touching upon themes of Power, Emotion and Gender to give a new perspective on the dynamics and dualities of ‘lived experience’. The blend of referents points seeks to afford different readings. In this way the message is discerned through the audience’s gaze, lead by intertextual reference. The work is intended as a framework for an audience to give form to their feelings examining the multifaceted and nebulous nature of ‘Being’. Aaron’s work will feature as part of PLATFORM 2018 in the Draiocht galleries, Blanchardstown D15 from Wed 21st February – Sat 31st March. Aaron Smyth is a Dublin-based Visual Artist, working in a range of mediums including Drawing, Digital Imagery, Sculpture and Printmaking. He has exhibited extensively both nationally and internationally. He is also the co-Founder of Gum Collective and Tonal Press.